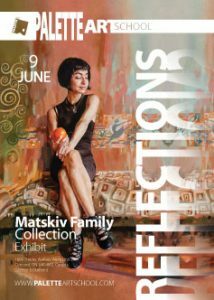 We are excited to invite you to a retrospective exhibition of fine art from the Matskiv family collection: Reflections: Modernism to Contemporary Realism, opening on June 9, 2019 at Palette Art School in Vaughan, Ontario at 1600 Steeles Avenue West, Unit 2. This event will mark twenty five years of putting together creations of renowned European and Canadian artists with one goal in mind: to build a cohesive body of works that celebrate and capture the beauty of the surrounding world, each unique moment at a time. By way of background, my daughter and I came to Canada in the summer of 1991 from the southern city of Odessa, Ukraine. It was the time of the disintegration of the Soviet Union, and all we brought to the new country was five prized possessions - paintings of close friends. They were with my family through the years of the uphill struggle we had to go through as new immigrants. They gave us joy and a strong sense of identity. They reminded us to be optimistic and stay positive. And, above all, they encouraged our interest in the work of other contemporary artists of different backgrounds. Through years of collecting, many of these artists have become friends and soul mates. Giving away a part of their talent, energy and thoughts coded in the canvases by way of vibrant colors and unforgettable images, they make us feel lucky and privileged by bringing us to a world beyond the mundane the minute we step in to our home. In this collection, you would never find trendy or politically themed pieces. For us, a painting or drawing is valuable only if it measures up to the best academic standards of the classic European school of fine art, yet projects a contemporary and powerful vision of a modern day master reflecting on spiritual matters. The scope of styles ranges from modernism to contemporary realism and mirrors the dynamics of our rapidly changing times, but never compromises on the quality of craftsmanship. We strongly believe that this collection is a valuable input in the Canadian collective cultural mosaic. We present it to the public as a not-for-profit event, proud to share a rich world of contemporary art by inviting the viewers to our spiritual home.